If you think about it, its funny that you rarely see Bloggers posting pictures of them sitting on their beds or at their desk, their main accessories not an Alexander Wang-a-like bag or a pair of Jimmy Choo stilhettos – but a laptop. You wouldn’t see a penguin catching some rays in the desert, an octopus hanging out of a tree in the rain forest, or a camel marching down Oxford Street in a pair of patent loafers… (or so I’d hope anyway!) so its only fair that every once in a while you get to see a blogger in their natural habitat, too! This is my new bedroom at Uni, which I actually really love; its spacious, airy and light! I’m having internal battles at the moment as to whether or not to decorate it up a bit or not… obviously, since I’m only renting, I can’t paint the walls or anything; but I want to pretty it up in a way which won’t leave it feeling too ‘busy’ – any kind of clutter makes my head spin! So for now I’m going to leave it, until I have a brainwave… so if anyone has any ideas for some crafty DIY decorations I could make cheaply, please let me know! Perhaps some bunting would look nice? What do you think? I would love the first dress here, the skirt is perfectly ruffly, and kind of reminiscent again of clowns with the white, red and navy blue colour palette! Some good ‘clown colours’ there… haha. Pretty sure I’m just making things up now, but hey! Also, there’s nothing wrong, in my opinion, with being inspired by past collections – If you’d like to check this one out in full, you can see it here! Note: there are no scary clown pictures in this post, for any clown-phobics who may be reading this! 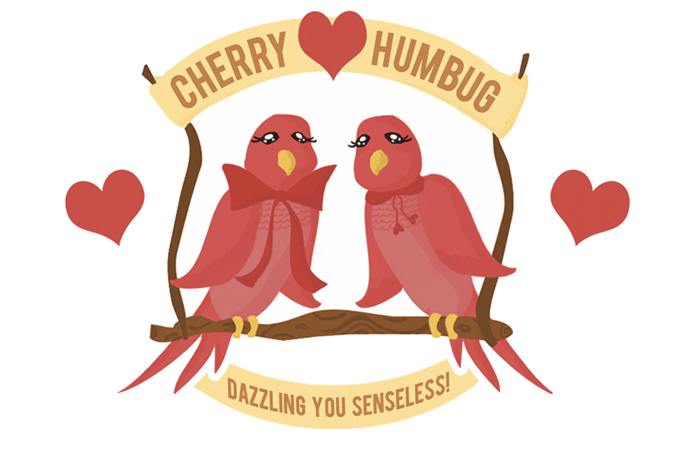 If you are a regular reader of Cherry Humbug you’ll already have spotted that I really like neck details – which is what drew me to this top! 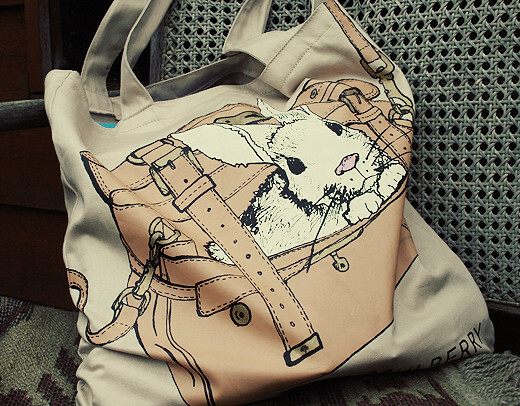 I got this in the sale at Topshop – which is the only time I ever really buy anything from there! Cheapskate, I know… haha. If memory serves me correctly (I’ve had it a couple of years now) this is from their ‘Petite’ range, which is quite funny really because at 5″7/8 I can’t exactly call myself petite! But nonetheless, it kind of goes to show that despite what sizes a shop might tell you you are, they can quite often be wrong! 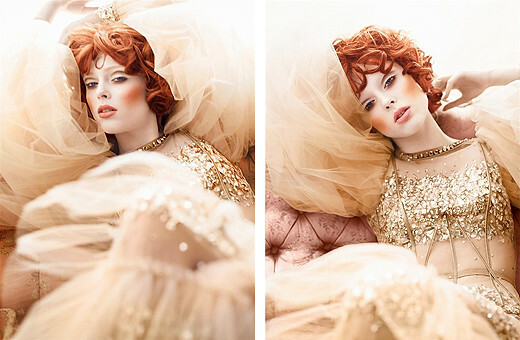 Although my ‘homage’ to clown dress isn’t exactly avant-garde/out there/very interesting, its a style I very much love looking at, so here are a few shots from a favourite editorial of mine: Numero magazine featuring Coco Rocha, who is absolutely the most gorgeous clown-lady I have ever seen! P.S Don’t forget to check out my LFW Streetstyle post over at British Style Bloggers if you haven’t already! P.P.S Without wanting to ruin anything for other Gossip Girl fans out there, I’m pretty sure I’m not the only Clemence Poesy fan who was excited to see her in the first episode of the new season, eee! My fashion-senses tell me she’s going to be one to watch this season! I’ve been trying to do this post for days now, but my first week back at uni has been rather time consuming! Between losing my phone (and getting it back again, phew! ), catching up with everyone in London and Rochester, bonding with my new housemates and nearly freezing on my way home from uni on Friday, I am very glad the weekend has come around again so I can get some nice R+R and have some spare time to finally blog… and also, catch up on the new season of Gossip Girl! Who else is excited about this?! As you may be able to tell by now, stylistically speaking I’m really inspired by the costumes worn by the gorgeous ladies of the Upper East Side. Whilst I know I’m most definitely not the only one to pull inspiration from the show, I really do have a lot of fun accessorizing outfits with bows, splashes of primary colours and whatever else I find along the way! I’ve always been kind of envious of people who manage to pull of the ‘laid back’ look, and have experimented with it myself in the past… but unfortunately, as me and Carrie were discussing the other day on our visit to Nandos (that place definitely brings out deep coversations, haha); not everyone can throw on a pair of jeans and a loose fitting t-shirt and manage to look ultra-glam! 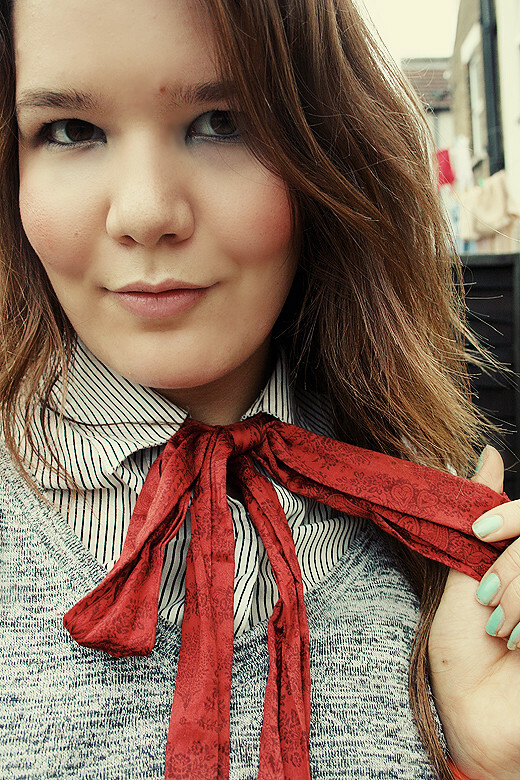 Remember a couple of posts ago I mentioned that I was going to be helping out over at British Style Bloggers? My London Fashion Week street style piece is now up, yay! So if you’d like to check it out, please do… I hope you’ll enjoy it, you may even spot some familiar faces in there, too! A big hello to you all! I’m pleased to inform you that we finally have internet installed in my new house – yay! So, from now on, blogging will be a lot easier, phewee. I finally got some new shoes… from Primark, even after I swore not to buy cheap again. 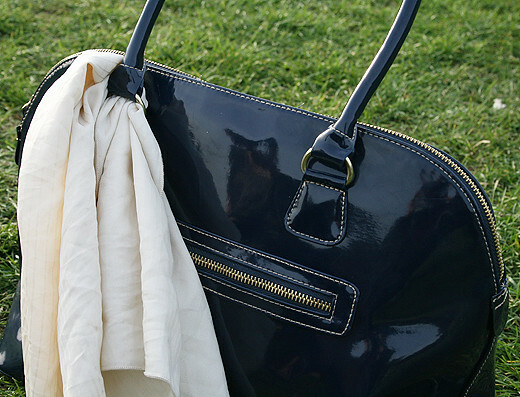 Ok, so I got two pairs, and a hand bag too… what is wrong with me? 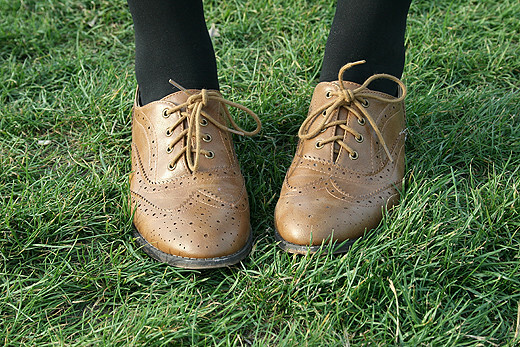 The brogues feel much more sturdy than any other shoes I’ve ever seen in Primark, so I was sold, and got them in two colours, for around £30 for the two – not bad eh? The problem with Primark clothes is that you see them on everyone, which is why I decided to accessorize the bag with a vintage scarf. Simple, but effective! 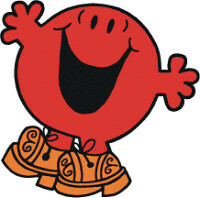 Although brogues are everywhere right now, and not in the slightest bit ‘original’ anymore, I kind of like them because they remind me of Mr Men shoes! Ahhhh nostalgia, how I love you. I had a couple of things to do in London today, so whilst I was there I caught up with Carrie. We fine dined in Nando’s, which is now officially my new favourite restaurant simply because the menu doesn’t cause my blood pressure to rise the second I open the menu. Being a vegetarian, I often find restaurants have limited choices available, which can sometimes be quite stressful, so it’s nice for once to have an option which isn’t vegetable lasagne or pizza! I think some of you non-veggies should give a veggie burger a go sometime – take it from me there are some really good ones out there! We also headed to Hyde Park, which was my first official visit. I felt quite at home lounging on the grass for a while. Having been amongst the hustle and bustle of the city, its the best feeling ever to be able to sit down in a huge wide open space, with lots of grass, especially for someone like me who grew up in the countryside; the ultimate refreshment! We even saw some people exercising (suit-clad doing pushups…) in work clothes, which we found to be a bit strange, but hey, each to their own! Haha. 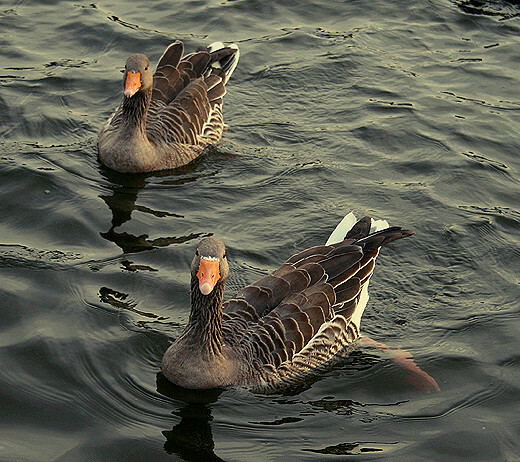 I’ve noticed lately that whenever there are ducks, swans or geese around, I get a little bit obsessed with taking pictures of them… so much so that Carrie had to shimmy me along from the lake so we could go and meet up with our friends, oops! Haha. What can I say? P.S I got to meet and hang out with some wonderful bloggers at London Fashion Week, one of which was Kirsty – you can check out her pictures over at Fashion Champage! Hello everyone! I apologize that I’ve been a bit quiet on the blogging front these past few days – I have moved into my new house for the oncoming university year back in Kent, and unfortunately, we have no internet at the moment! But alas, all is not lost, I’ve sorted something out so I can catch up with all of your wonderful blogs and such for today : ) I did think I was going to have to pop into the little coffee shop along the road, which would’ve been very Perez-Hilton-&-Coffee-Bean of me, but now I’m back full swing into the student life, that just seemed like a lot of effort! Shocking, I know. I’m so glad to be reunited with my full wardrobe, and it actually feels like I’ve opened up a whole cupboard full of new clothes – which is always a good thing when it hasn’t cost you a penny! : ) I’m not so happy to be reunited with the endless amounts of junk/paper/general randomness I accumulated during my first year of uni, but hey, gotta take the good with the bad, right? I wasn’t really sure where to use as my new ‘photo spot’, because my room here is a bit ‘busy’ (but amazing, might I add… I have my own mantelpiece, how cool is that?!) but I figured the garden, which is about as ‘unbusy’ as a place could be, would work nicely! The dodgy looking chair I’m poised on looks just about ready to break at any time, so unfortunately I doubt I’ll be doing any proper ‘sitting’ out on it; despite the fact it would make a nice little reading spot, haha. 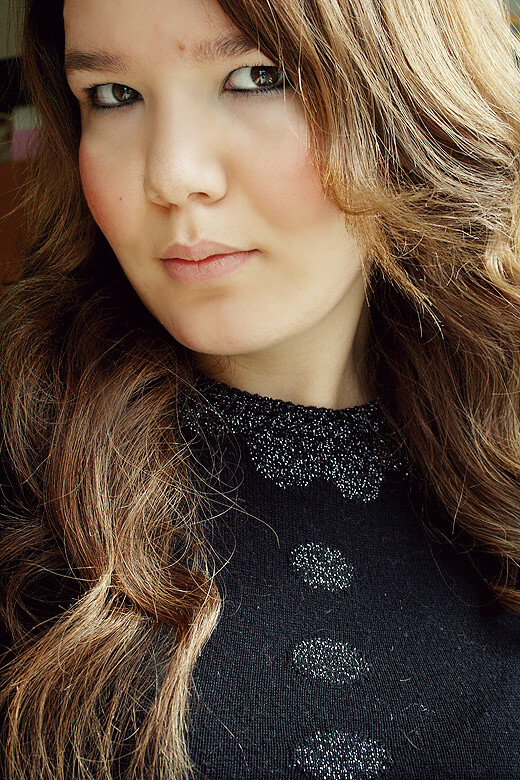 P.S Sorry if I’m looking a bit grumpy in the photos! I was fretting about the light and the possibility that the chair might collapse mid-shot – now that would’ve made a good photo wouldn’t it? 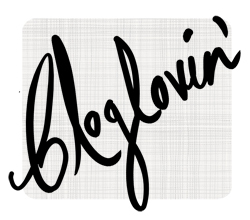 P.P.S Remember, you can follow me on Twitter, Bloglovin’ and the one I always forget to mention, Formspring! The main problem I’ve had this summer, when it comes to dressing, is that half of my belongings are in storage back at my old university halls. Or, I should say, the main problem is that I just can’t remember what I have and haven’t got! This can be a bit of a nuisance when it comes to deciding what to wear, especially when you discover that one, two or all of the pieces you’re looking for are actually cooped up 100 miles away in a box… not cool, and not useful at all. My brain has well and truly turned to mush this summer, what can I say! However, it has meant that I’ve been forced to utilize the clothes I do have, like this stripy top which incidentally, is almost identical to another one hanging in my wardrobe… meh, guess I didn’t really think it through very well when it came to picking things to bring home, well done me! I also found an old dressing gown, which is pink, with swirls and purple monkeys on – something tells me I won’t be wearing this out any time soon, haha. Its a shame we didn’t do the whole ‘debutant’ thing here, because that would’ve been perfect… Monkeygowncouture = fabulous, and so this season! On a random note (does it get more random than a pink monkey dressing gown?!) 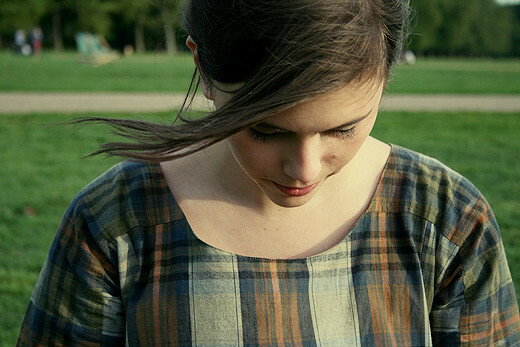 I’ve just got back from watching ‘Tamara Drewe’, or ‘Nancy Drew’ as I kept accidentally calling, oops! I must say, although I didn’t enjoy the film as much as I thought I would, Gemma Arterton = my new girl crush, she has such a perfect face. Wit woo, she makes me proud to be a Brit! I can honestly say though, having lived in the countryside all of my life, that most people where I’m from, out in the middle of nowhere, don’t dress half as glamorous as this! But hey… who wants to see a film where the leading lady has hay coming out of her hair and cow food down her clothes in every scene, eh? Haha. I’m off to catch up on NY Fashion Week collections now – so many pieces to add to my fantasy wardrobe! What are your favourites so far?! “Wow, what an ugly jumper!” was pretty much what came into my head when I stumbled upon this, uh, beauty(? )… on a charity shop rummaging session. I’m pretty sure there’s not much ‘beautiful’ about this big chunky cable knit jumper in the typical sense of the word (its not very dainty or delicate, floaty or floral, nor does it do much for a person’s silhouette) but oddly enough in all of what I thought to be ‘hideousness’ I actually kind of (against my will) fell in love with it, and so now, it hangs proudly in my wardrobe! Well, chucked in the top of it if we’re going to be technical… I haven’t got enough room for jumpers at the moment; I’m currently hovering in that awkward between-season time period, where I’m not really sure whether I should be keeping such jumpers or summer dresses on standby! 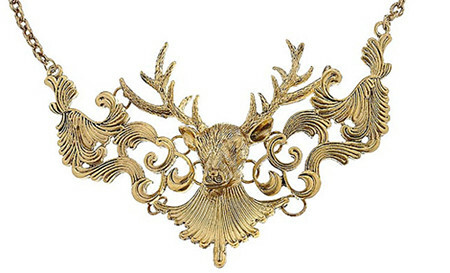 All this speak of deers and Bambi reminds me of this stag necklace, which in my eyes is actual jewellery perfection! I think perhaps I’m the same with necklaces – find one I like, and wear it all the time… not stuck in my ways at all, am I? Another thing to add to, what is now becoming a list, of new year’s resolutions – mix things up more! I saw this particular one in a magazine probably about a month ago, and will be keeping my eyes peeled so I can check it out properly in Topshop when I hit Oxford Street in a week or so. I’m also really looking forward to seeing how the high street is going to take on the ski-knit trend, as perfectly demonstrated by D&G, one of my favourite A/W 2010 collections; it’ll be interesting to see how daring the high street will be – I’ll be hoping they can bring something fresh to a trend which no doubt springs up every year, without going OTT and bringing out neon variations and whatnot, hmmmm. So the question is, which will be brave enough to bring out their own ski-knit onesie? This could get interesting… watch this space people!